Jon Favreau burst onto the scene in 1996 as the writer and star of Swingers, and his ascension continued with major directing gigs like the two Iron Man films. When you’re shooting movies with astronomical budgets, it’s hard not to lose your originality. His most recent outing Cowboys & Aliens was a critical and financial disappointment, and it arrived three years ago. Favreau has been doing some soul-searching and was looking to work on a smaller scale. While it may sound like a step backwards, that’s hardly the case. Chef reveals the heart that attracted people to him in the first place. Its characters mean well and are just looking to find their place. There’s a similarity between the career paths of Carl Casper and Favreau. When money gets involved, it’s hard to stake your claim as an individual. Playing to the middle rarely leads to exciting creative results. Favreau plays Casper as a nice guy who’s self-involved but not in a malicious way. He’s been cooking the same meals for Riva’s (Dustin Hoffman) restaurant for too many years. I’ve worked in mundane office jobs, so I can sympathize with this feeling. You don’t even realize how much the lack of creative thinking is impacting the other aspects of your life. Casper spends time with his son, but he’s always focused on his job. He can’t even enjoy a roller coaster without checking his phone. Who has time to be a good dad when you’re running a restaurant? I expect that Favreau has faced a similar situation with his kids. Casper is constantly on the move and pushes back the lingering questions in his mind about his predictable job. It’s only a matter of time before something cracks inside his soul. 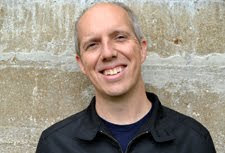 The instigator of this life change is a powerful food critic (who else? ), and all it takes is a bad review to knock Casper into manic territory. His public outburst against the appropriately named Ramsey Michel (Oliver Platt) certainly springs from Favreau’s opinions about unfair critics. There were harsh reviews written about Cowboys & Aliens that probably mirror the clever barbs from Michel. In one sense, Casper’s statements that critics aren’t creators make sense. In this particular case, the bad review goes viral and hurts his reputation. On the other hand, Michel ends up being more than a one-note villain. We aren’t in Shyamalan territory from Lady in the Water. He devastates Casper’s confidence, but his main points are correct. The generic cooking lacks creativity and doesn’t match his immense talents. Chef advertises for the greatness of many things, including food trucks, New Orleans, and Twitter. 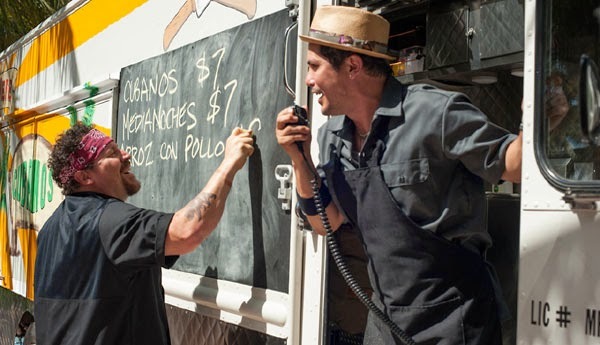 Favreau presents the simplicity of working on a truck and making dishes that people love. These aren’t patrons that have been ordering the same food for 20 years. I’ve been a recent convert to food trucks, so he’s preaching to the choir. The use of Twitter feels natural, though I expect they spent a pretty penny bankrolling this project. Making Casper’s 10-year-old son Percy (Emjay Anthony) the social media expert works because he cast the right actor. Anthony looks much older and sells the boy's intelligence. The Casper/Percy relationship connects directly to the chef’s search for his creative identity. When he’s doing something that he loves, it’s easy to convey that joy to his son. The main reason the story works is because of the cast, and everyone is bringing out their genuine side. It feels like they believed in the material and enjoyed supporting their friend. The scene where Casper welcomes Martin (John Leguizamo) to the food truck and tells him the pay is nothing matches how I picture Favreau’s meetings with the cast. Leguizamo is rarely this likable and perfectly depicts Casper’s loyal ally. He’d rather give up a lucrative job as a sous chef than not work with Casper. Scarlett Johansson, Bobby Cannavale, Sofia Vergara, and Robert Downey Jr. join the fun, while Hoffman gets the most thankless role as the less creative owner. That guy is hardly an evil villain, however. He takes a different perspective on the restaurant business and isn’t totally wrong. If there’s an area that’s lacking, it’s the depth of the female characters. Johansson’s Molly is charming and gives Casper the push that he needs. However, she’s essentially on the screen to offer advice and love the guy. Favreau and Johansson sell their connection, but it’s a pretty thin character. That’s also true of Vergara as Casper’s ex-wife Inez. It’s clear why he’d want to be with her, and she’s a very likable character. Even so, she’s a reactive creation that’s just waiting around until Casper finds his way. Vergara also sells Inez as a real person, and it’s only with more consideration that we recognize the limited portrait. These issues are hardly fatal because there’s so much niceness on the screen. The conflicts are clear but are mostly in place to showcase the positive sides of Casper’s regeneration. 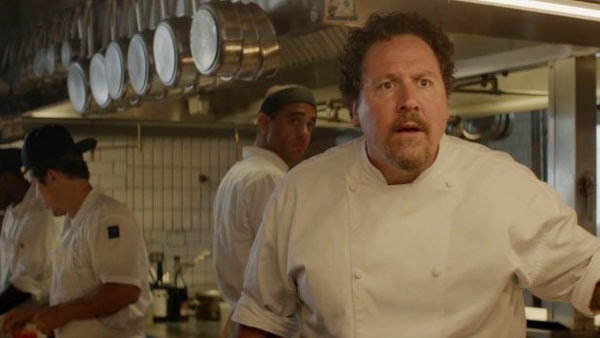 Chef is one of those films with extended sequences that will send you scrambling for the kitchen. The food looks gorgeous, and Favreau presents it majestically. The soundtrack is filled with jazz tunes, and that brings vitality to simple moments like driving down the highway. This is the type of movie that may turn off cynical viewers, and I can understand that reaction. Even so, it reveals a heart that’s been missing from Favreau’s recent work. There’s nothing wrong with directing a blockbuster about superheroes. The question is whether those projects match up with Favreau’s skills. He seems more at home with this smaller story about a guy who’s becoming engaged with life. Casper’s speech to his son about his love of cooking should resonate with anyone who loves a creative activity. When we’re immersed in our favorite pursuit, is anything better? Nice explanation of the parallels between the character and the creator. Since he wrote the script, it is easy to accept that this reflects his own experience. The food scenes will make you crave the dishes. Instead of action figures could we get the truck making Cubano sandwiches franchised please. Oh man. I would be all over those sandwiches if this food truck actually existed. I normally try to avoid making too many assumptions about a movie's connection to the writer or director. In this case, however, I feel like Favreau's experiences with blockbusters and his three kids had to play a big role in this project. I saw this film last month as I enjoyed the hell out of it and finally convinced my parents (who rarely go to the cinema) to see it and they fell in love with it. Most of all, the food. Cuban sandwiches, beignettes (I haven't had those in years...), all of that good stuff. That's great to hear. My wife and I saw Chef on a rare night away from the kids, and it was a perfect choice. It helped that we saw it in one of those theaters where they bring you food. Nothing we ate matched what was on the screen, but it was a start.